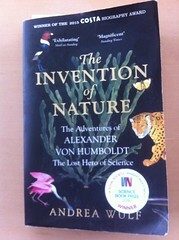 The Invention of Nature is Andrea Wulf’s biography of Prussian scientist-naturalist-ecologist-explorer, Alexander von Humboldt, whose travels in the Americas gave us Humboldt’s Penguin, amongst many, many other things, and whose renown resulted in place names ranging from Mare Humboldtianum on the moon to Humboldt University in Berlin. Most importantly, via the publications, lectures and correspondence that occupied Humboldt for the majority of his long life, he developed the concept that has been called Humboldtian science – a holistic view of science and nature, climate, the environment and ecology, and by extension encompassing art and society. During his lifetime he engaged with politicians, revolutionaries, scientists and artists – Thomas Jefferson, Simón Bolívar, Charles Lyell, Johann Wolfgang von Goethe – and his writings continued to influence key scientific, cultural and artistic developments of the 19th and 20th century; Darwin, Thoreau and John Muir were all fans, as were George Perkins Marsh and Ernst Haeckel who I’d not heard of before reading this book. And you’ve never heard of him.